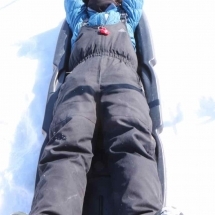 It was to study diatoms, the microalgae that dominate phytoplankton blooms, that the “silica and diatom” team came to Qikiqtarjuaq. 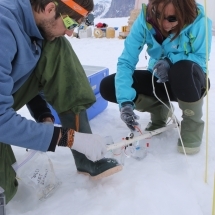 To follow the evolution of the phytoplankton bloom, successive Green Edge teams focused their efforts on measuring how fast diatoms form silica shells (frustules) and the rate at which the frustules dissolve. 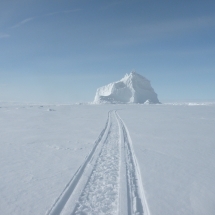 Aude Leynaert was the first to reach the ice camp on May 5, 2016. 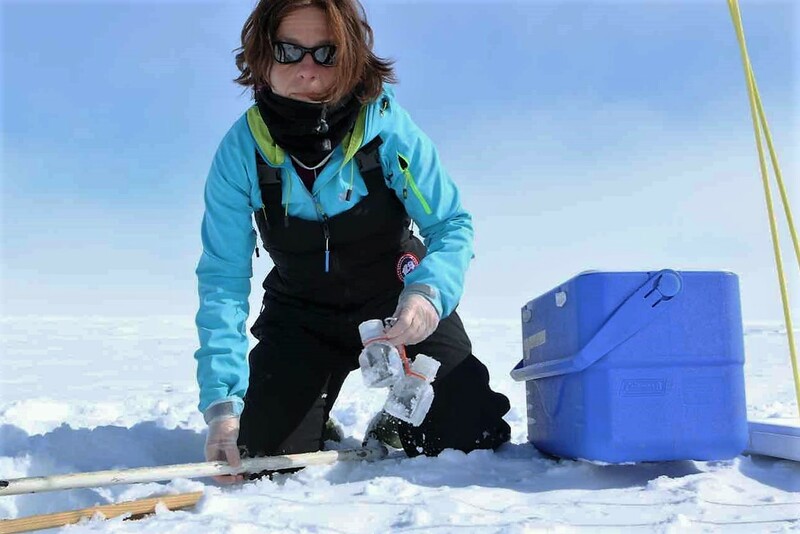 A month later, Véronique Cornet-Barthaux and Morgane Gallinari took over! 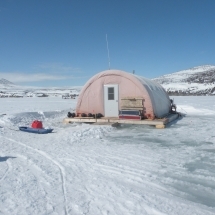 Justine Legras, Bernard Quéguiner and Brivaela Moriceau are the last to arrive at the camp! 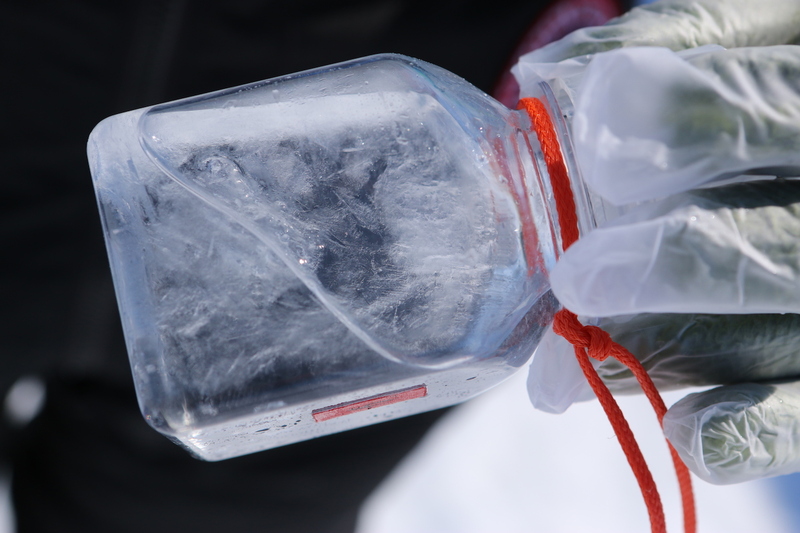 In Arctic ecosystem (ice and water column) there are more than 200 different species of diatoms. 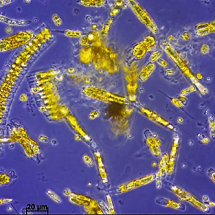 Diatoms, plytoplanktonic cells that contribute efficiently to the biological carbon pump, have the particularity to produce a shell (frustule) composed of biogenic silica from dissolved silica in water. The silica shell allows them to protect from predators and act as a ballast. 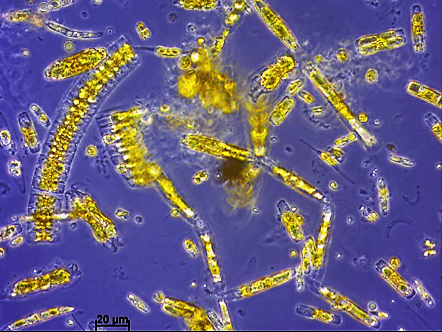 To give another example of the importance of these microalgae, diatoms produce a quarter of the oxygen that we respire. 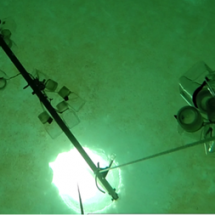 They are also the principal source of nutrition for zooplankton and benthic filter feeders. 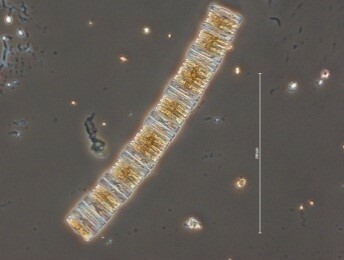 Ice diatoms are characterized by pennate species that form colonies. 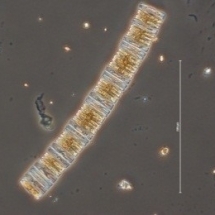 They develop well in advance of diatoms in the water column, which can be either pennate or centric. How fast do frustules form? 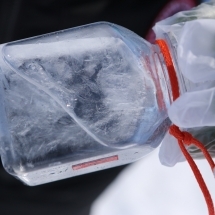 To measure the speed at which they form frustules or shells of biogenic silica, diatoms are incubated in flasks under temperature and light conditions conducive to natural growth. 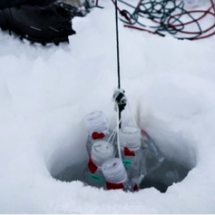 To achieve these conditions, we attach the flasks to an articulated arm that extends through a hole in the ice and maintains the bottles at the proper depth in the water. 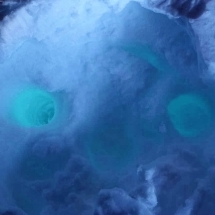 In the Arctic, algae don’t only grow in the water, but also reside on the underside of the sea ice. 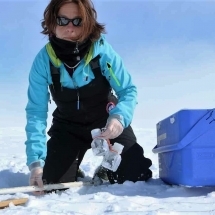 Therefore, it is necessary to sample both the water column and the very bottom centimeter of ice core where most of the sea-ice diatoms live. 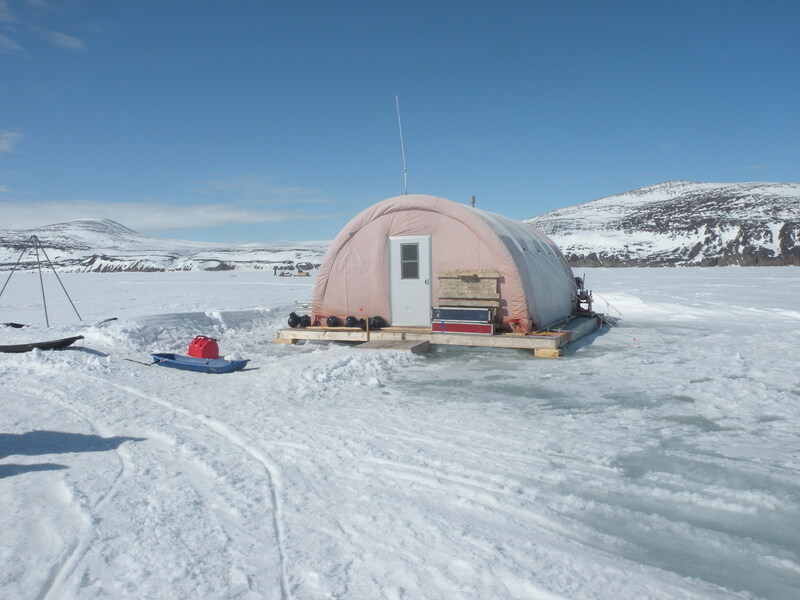 In order to protect the diatoms from daylight stress, ice coring is performed under a tent, in the dark. 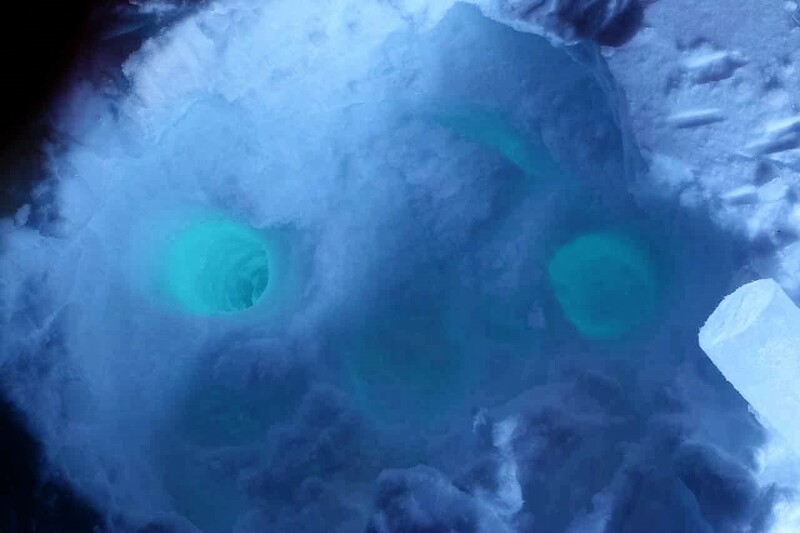 While it is obscure in the tent, there is a lot of light coming out of the water under the sea-ice. Colors are delightful. 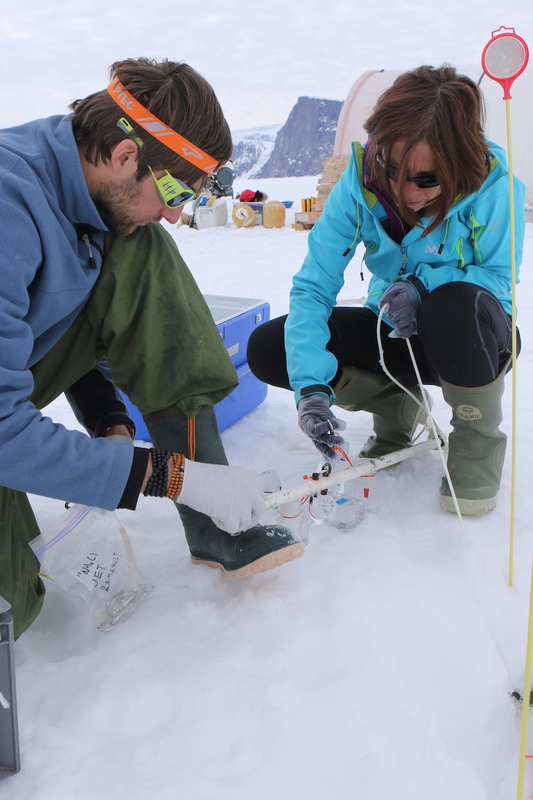 This year, we have also incubated small cores directly in filtered sea water. 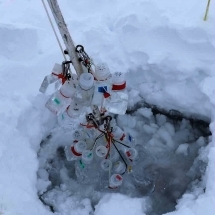 This technic allows to avoid altering or disrupting the so peculiar ice environment of microscopic channels and pores that hosts ice micro-algal assemblages. 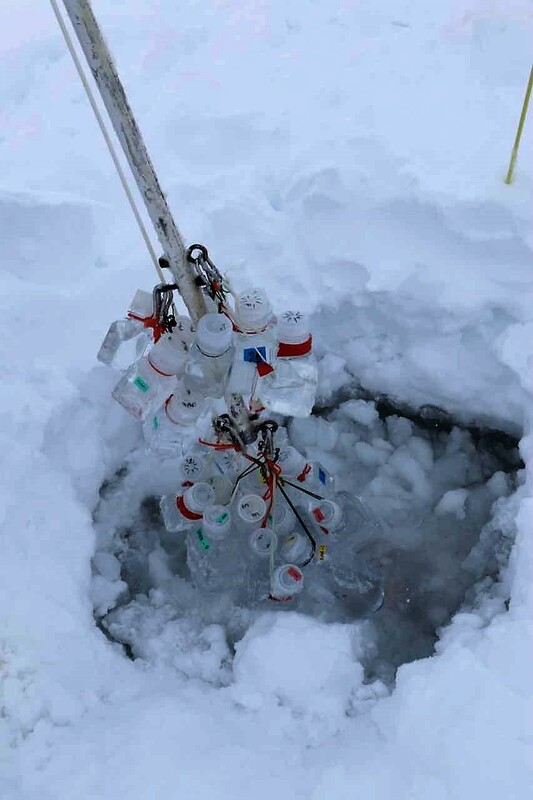 At ambient air temperature between -25 and -15°C, it is not easy to prepare for all eventualities when we are not accustomed to working at temperatures where the samples freeze as soon as they are removed from the water, which is -1.87°C. 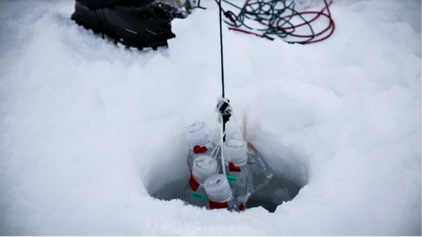 We use ice-cooler to keep samples from freezing and to protect them from light stress during transport between the camp-lab and the incubation hole outside. 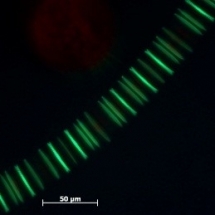 We can know the contribution of each diatom specie to the total silica deposition activity from total diatom community by using a fluorescent dye, the PDMPO. 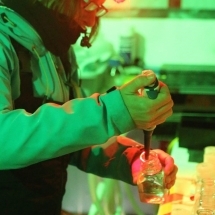 The PDMPO method is based on the fluorescence of biogenic silica after incubation with the dye. 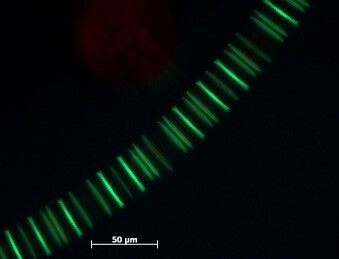 Only those cells that have been depositing silica to form a new frustule valve upon cell division exhibit a typical fluorescence that is proportional to the amont of biogenic silica deposited. 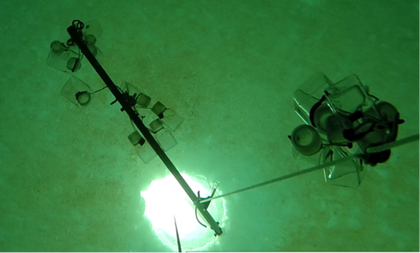 In this way we assess the total diatom community incorporation of PDMPO ﬂuorescence diatom frustules but especially we assess the quantify the ﬂuorescence of PDMPO in single diatom cells. 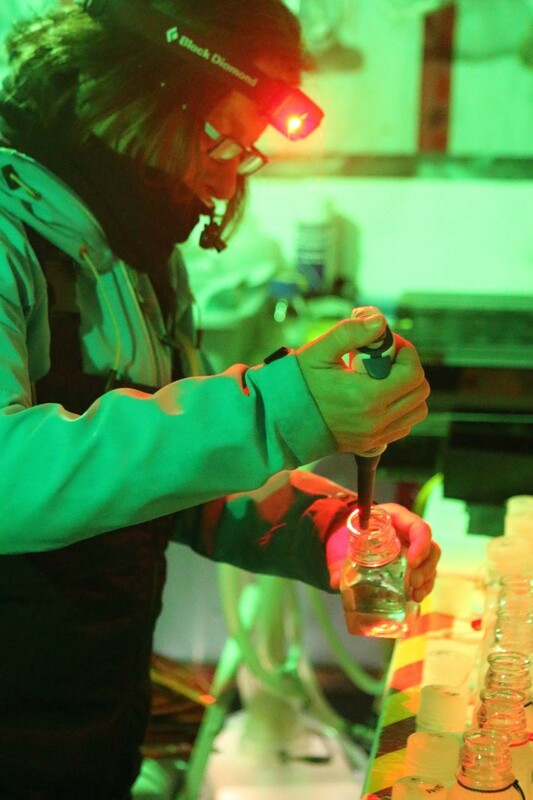 After 24 hours of incubation and filtration, samples are keep at 4°C and will be analyse by fluorescent microscopy in Marseille. 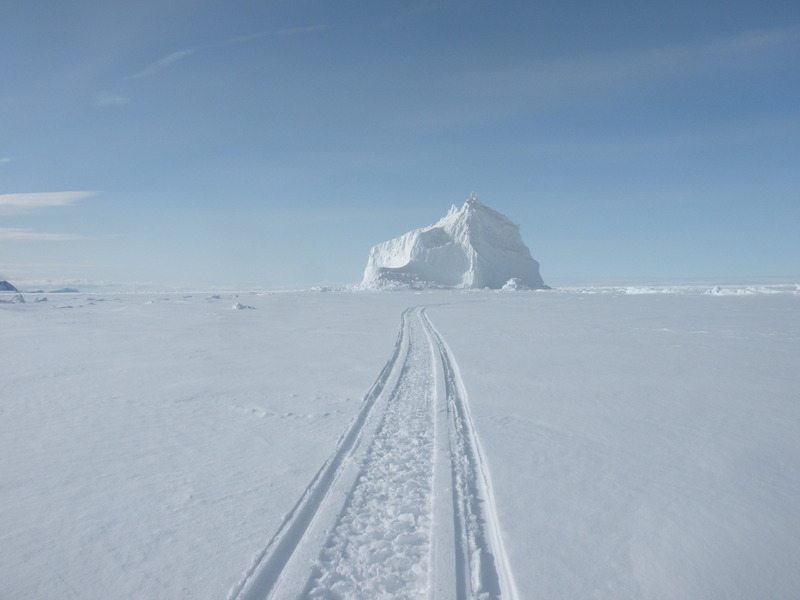 We obtain very nice pictures! 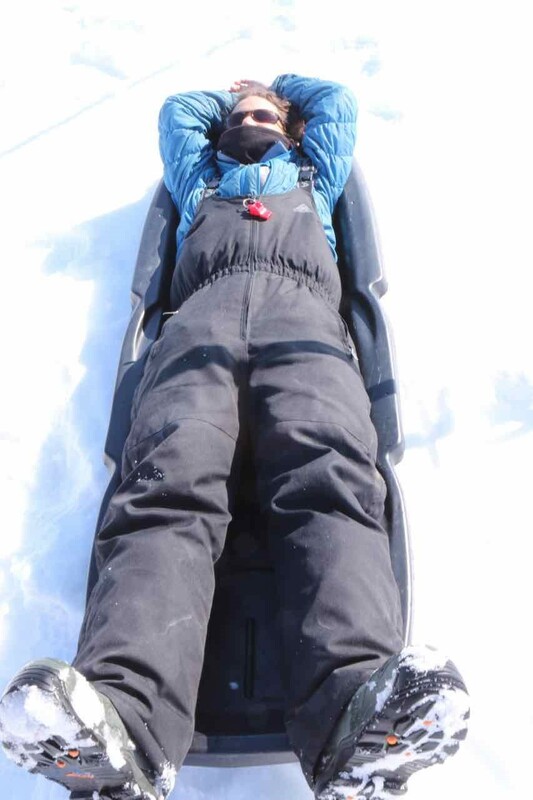 At the end of the day, everyone is exhausted.